Shmuel Blitz has done it again! The author whose books help children look forward to bedtime, has penned another collection of charming tales for youngsters. This delightful book of bedtime stories is all about Shabbos, helping children understand its beauty and significance. Some of the stories are funny, some are moving, some teach important lessons - and all are a joy to read, again and again. Illustrated in fabulous full color by Tova Katz, each tale is alive with warmth and gentle wit. 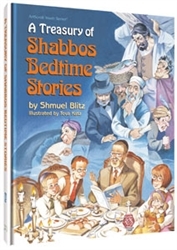 So let your little ones snuggle under the covers as they hear about Shabbos in ancient times and foreign places, and Shabbos in our lives today... It's the sweetest way to end a wonderful Shabbos night!